How Did The Alfa Romeo Giulia QV Lose To A BMW X6 M And Ford Focus RS? It should easily cream those cars on the track, so is the driver at fault or is the Giulia QV less impressive than we thought? 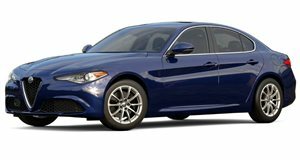 Central to the Alfa Romeo Giulia Quadrifoglio’s stardom, aside from its wicked looks, wonderful steering, pristine chassis, and epic handling, is its 2.9-liter twin-turbo V6 engine. It delivers 505 horsepower and sounds great while it does it, making it a serious contender to the BMW M3. Reviewers around the world, including Chris Harris and Motor Trend’s Jason Cammisa, Jonny Lieberman, and Randy Pobst, have found it to be faster than the M3 equipped with the Competition Package. Even if it only beat the M3 by a sliver, that’s not what happens here. The Fast Lane Car hands the Alfa Romeo Giulia Quadrifoglio to its reviewers, Paul and Andre, to put it through its paces as part of its Hot or Not series. Despite the fact that the reviewers found the QV to be hot, the lap times it pulls makes it seem as if it earns more of a not. After a twitchy lap around TFLC’s resident test track, the Giulia QV manages a time of 1:04.45 minutes. That’s “hella” disappointing compared to findings from other sources, putting it slightly behind the portly BMW X6 M and three tenths of a second away from the lesser Ford Focus RS. Even the BMW M2 shoots ahead of it with a lap time of 1:03.69 minutes, and unfortunately there’s no BMW M4 or M3 on the lap board to compare the Giulia QV’s time to. Our bias towards the Alfa makes us want to say it’s inconsistency with the driver’s skills that’s to blame (not like we could do much better, but these cars need a pro to properly dissect them), so we’ll skew our confirmation bias to Motor Trend and Harris’ results. Do you agree?